Lately I’ve been on a 90’s kick. Am I the only one? I didn’t really love the fashion back then, but for some reason I’m sort of drawn to it now. Nostalgia maybe? 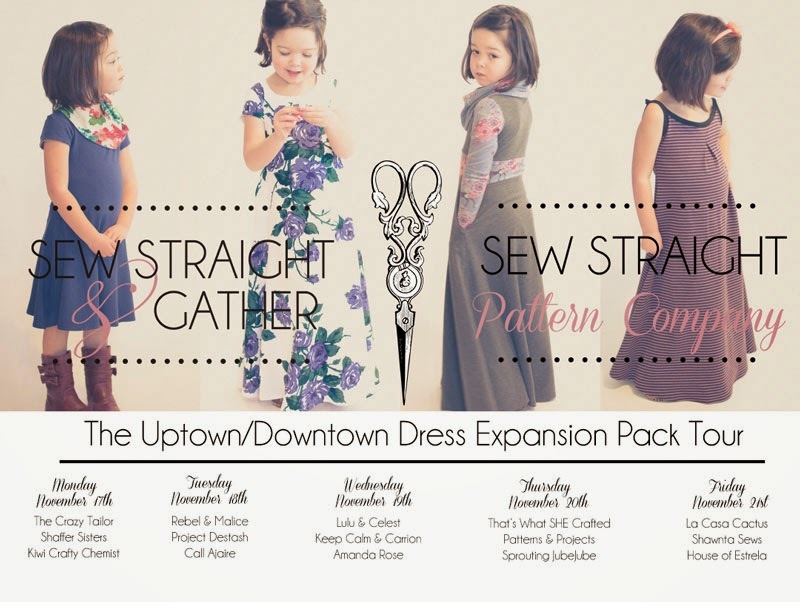 Anyway, you’ve already had a sneak peek of my reversible long sleeved maxi Uptown/Downtown Dress, but as part of Sew Straight and Gather‘s pattern tour I’m giving you the all the details. First of all, I met Terri through Pattern Workshop (*affiliate link) and I can tell you without hesitation that this lady works hard at what she does. Even before I had the pattern in my hands I would have recommended it, and I wasn’t surprised at the amount of detail in the pattern instructions once I read them. You can tell by the questions she asks in the group and her responses to other people’s questions that she is someone who won’t rest until her pattern is perfect. It’s refreshing to see pattern designers who care as much about the instructions and minute details as they do about the finished garments or basic design. Now, let’s talk about this dress! 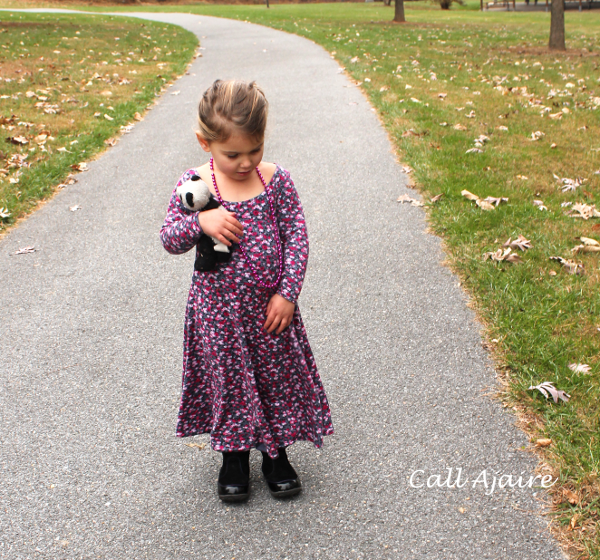 The basic Uptown/Downtown dress is an A-line dress made to work with jersey knit. There are two sleeves as well as a no sleeve option. The new free expansion pack has taken the pattern to another level. 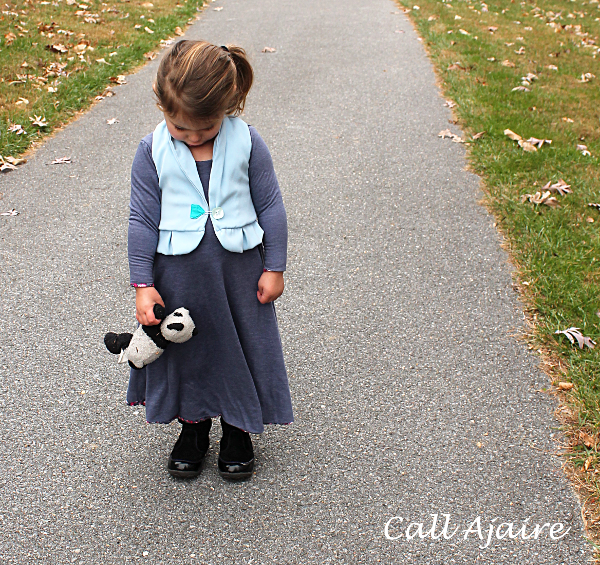 The new options to mix and match are: long sleeve, maxi length, cowl neck, color blocking, pockets, and tank. I chose to use the Maxi length because it felt pretty 90s to me and I was dying to see what Bean would look like in a long dress. 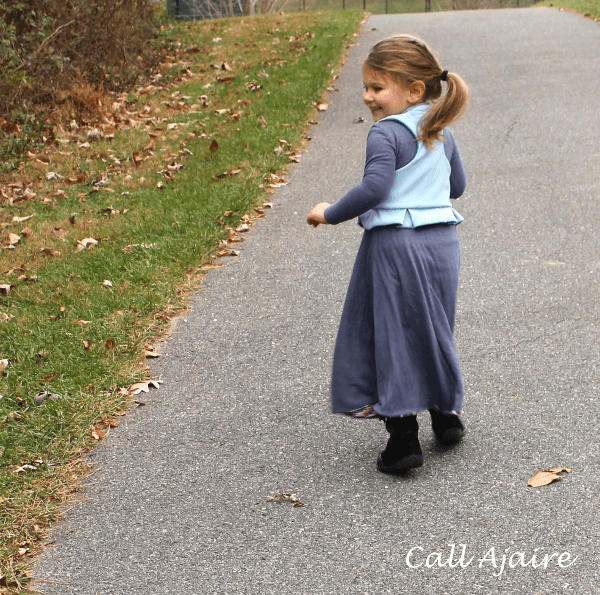 It’s also getting colder and colder here so the added length is perfect for keeping warm without having to add leggings. I used the long sleeves for warmth as well. 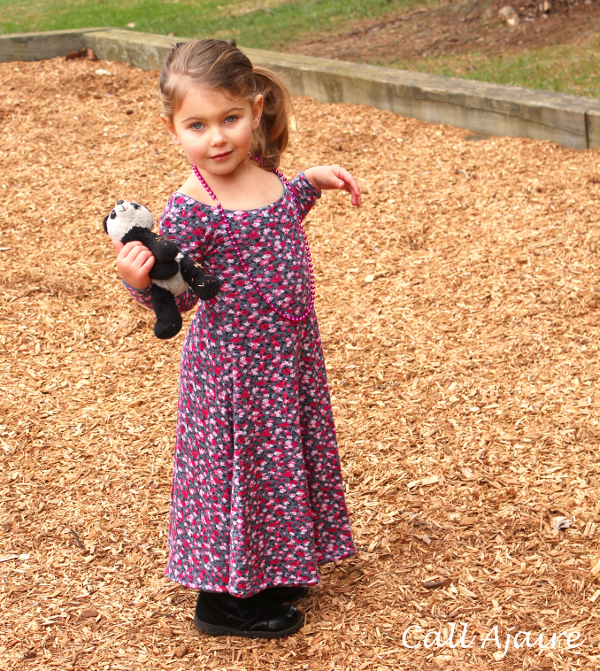 The pattern has an option for making the dress reversible, but that option is meant to use with the no sleeve option only. I used it with the long sleeves and it worked great so let me tell you briefly how I did it. Keep in mind that these drawings are not to scale, not really the shape of the uptown/downtown dress, and just overall pretty basic, but I think they’ll help demonstrate a difficult to explain, yet easy process, so try not to laugh, ok? Start by going through Steps 1-4 in the pattern. When you get to Step 5 we’re going to sew in the four sleeves. The pattern uses a set in sleeve, which I normally love, but that doesn’t work for this reversible option. 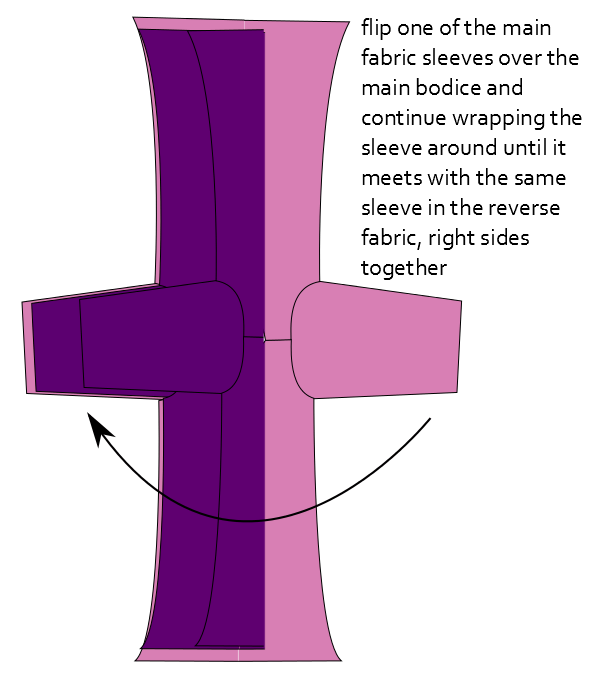 Instead, pin and sew each sleeve to just the armscye it is meant to fit: main fabric to main fabric, lining to lining. So what you’ll have at this point is two dresses that have been sewn together at the neckline and have their sleeves sewn in without the sleeve side seams and dress side seams sewn. 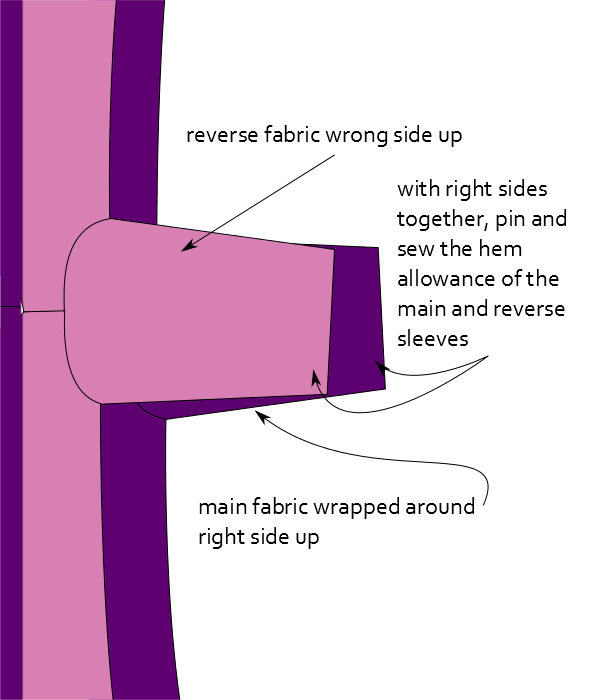 With right sides together, pin and sew the main fabric sleeve hem to the reverse fabric sleeve hem. 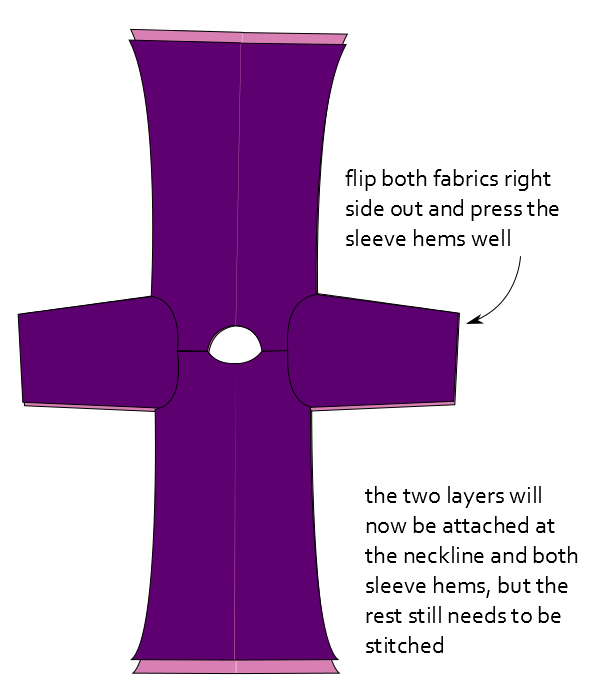 Flip everything back to right side out and do the same process with the other sleeves. Flip everything right side out again and press the two sleeve hem seams well. The two layers are now attached at only the neckline and the sleeve hems. In order to get the side seams sewn, we need to rearrange the pieces. 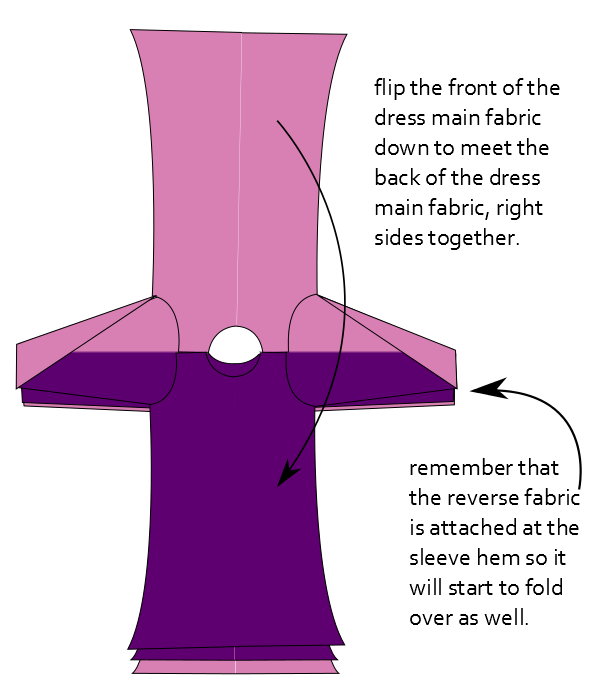 Flip the front of the dress main fabric down to meet the back of the dress main fabric. 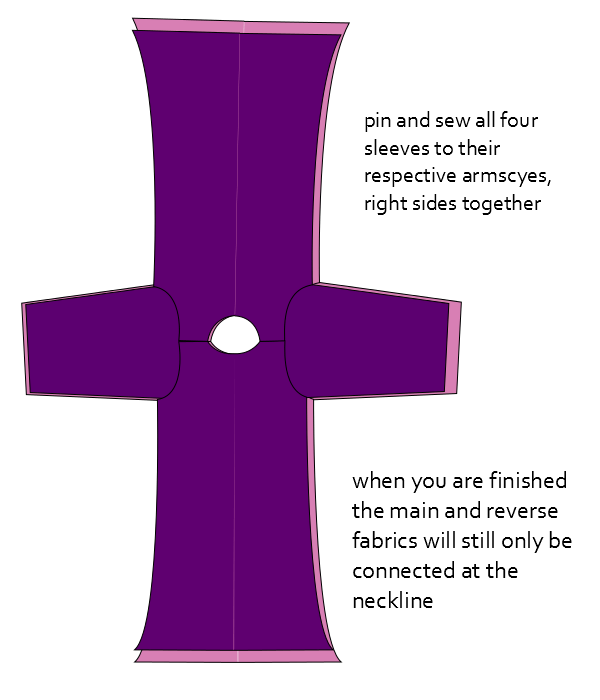 The reverse fabric is attached at the neckline and sleeve hem so it will move a bit too while you line up the main fabric. Now flip the back of the dress reverse fabric up to meet the front of the dress reverse fabric right sides together. The shoulders and arms of the main and reverse fabrics aren’t attached so this will now look like two dresses that have their necklines attached and sleeve hems touching. 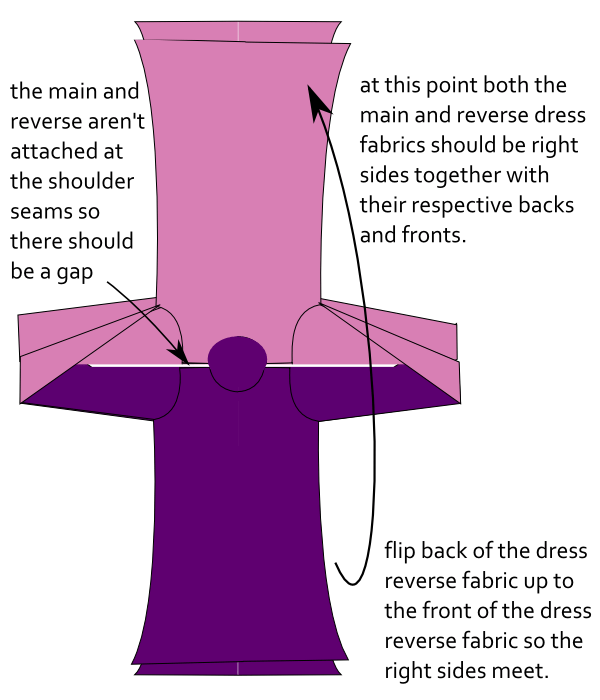 Working on one side at a time, continue to open up the shoulder/arm gap and line up the side seams of the dress. Pin from the hem edge of the dress reverse fabric all the way down to the hem edge of the dress main fabric. Sew this seam, taking care at the underarm seams and especially at the hem seam where the two fabrics come together. Matching those seams precisely will ensure the sleeve hem will lie nice and flat in the end. Repeat this with the other side of the dress. As Bean’s expression shows above, you may think these instructions may seem a bit crazy, but I promise you it works. Once you’ve flipped everything back to the right sides out and pressed your seams you will have a reversible dress that just needs hemming. 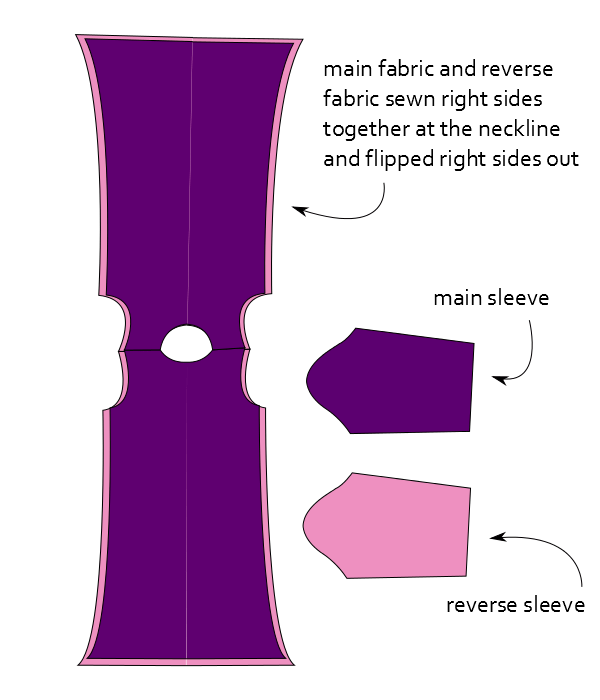 If you jump to the Reversible Option in the pattern you can now follow Terri’s reversible hem instructions even though it says it’s for the sleeveless version only. Success! The fabric I used for the floral side is from Wanderlust Fabrics and the blue/grey fabric is from G Street Fabrics which is a local store. They are both jersey, but the floral is a bit heavier so it shows just a bit on the blue side. You could prevent this by topstitching, but I liked how it look so I emphasized it when I pressed it. Ooh I love your dress! Great illustration too- you are amazing. I agree about Terri- she's a perfectionist and I love this pattern! Wow love that you have made the long sleeves reversible as well. The winter versions of this dress are so lovely. I made the tank as we are heading into summer ut I can't wait to make some for next winter as well. I love the lines of this dress!! Reversible! Thanks for the tutorial…I want to try that! Oh my goodness, me too! I can see this being on Claire Danes in My so called Life. I hated the 90s. 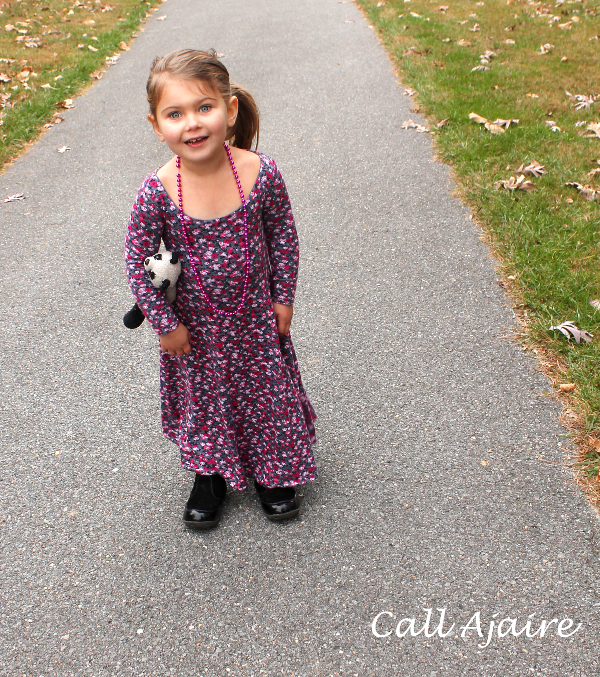 Now I am putting some 90ish things on my kids. Oh noo! But it is adorable and the tutorial is perfect! It's such a good pattern. Thanks Amy! Me too. Especially in the maxi length. It's super easy! I'd love to see what yours turns out like! if you have any questions, let me know.